The AT-36 offers 451 different functions. Includes statistical, trigonometric and hyperbolic functions, permutations and combinations, logarithm and exponent functions, fractions, powers and roots, metric conversions, base-N and logic calculations, complex-number calculations, equation solving, coordinate transformations and calculations with constants. Also features replay and answer functions. Holds up to 5 numbers in the memory for easy retrieval. Calculator has 10 memory variables. You can store a real number in variables A, B, C, X, Y, M, X1, X2, and 2 expressions in PROG1 and PROG2. The keys to store, recall, clear or assign values to variables are [P/V RCL], [SAVE], [RECALL], [CL-VAR], [CL-PROG], [M+], [M-] and [MRC]. In total, there are 8 keys. Display includes 10 digits with a 2-digit exponent - on 2 lines. Automatically shuts off when not in use to save battery power. Runs on 1 LR44 battery (included) and solar power. 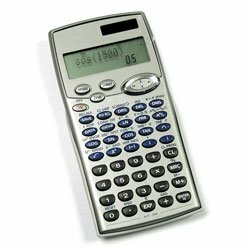 Carrying case protects your calculator in transit. 6 1/8"H x 8"W x 1/2"D.